Our dream? To revive the Alta Langa as a place of excellent gastronomy and as an extraordinary land to live in and discover. Our Truffle bed (tartufaia), recently recovered and brought to its natural splendor of old, was planted with symbiotic plants and mycorrhized so as to favor development of white and black truffles. This creates an interesting area of cultivation that renders the truffle hunt unique in this spot. What we have in mind is to create a truffle bed that is the center of truffle “production,” open for visitors and truffle hunters alike, at any time of the year. 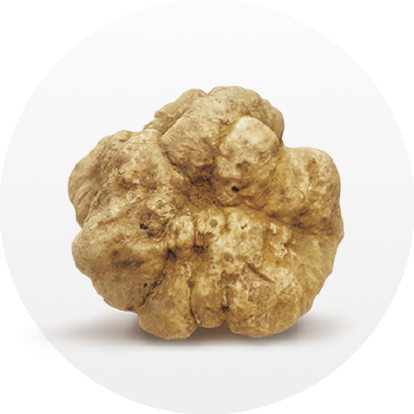 It will be a place for education and discovery of the truffle in all its nuances, from formation to characteristics, ideal environmental conditions to the plants that encourage their growth, and methods and tricks to its sensory analysis. It will be an open air truffle school, its students all food lovers and its classroom the beautiful, surrounding countryside. 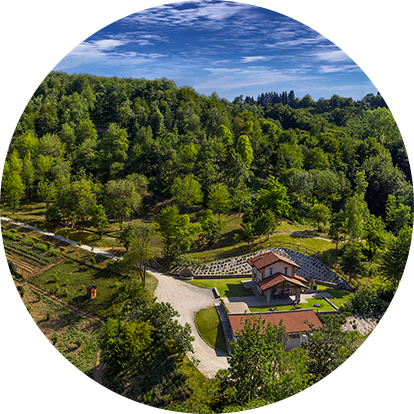 Our Azienda Agricola is situated in the town of Cerretto Langhe (of communities Cerretta and Pedaggera), about 10 km from the hills of Barolo, 18 km from Alba, and 80 km from Savona. It is also part of the Mountain Community of the Alta Langa. The area of the Alta Langa has a striking atmosphere characterized by its unique character of being “a land between.” On one side, the zone is characterized by its mild climate, sunlit and ventilated by Liguria with thriving, uncontaminated vegetation. On the other, it has a wild beauty in its centuries-old woods, its isolated, mysterious hills and valleys, and in the trails that curve through gulleys trickling with clear-flowing brooks. The Alta Langa was always considered an important trade stop with its position situated between the coast, plains, and Alpine valleys. It naturally became an important zone for castles and fortifications, and many are still standing today in the medieval towns and strongholds on the highest hills. To experience the Alta Langa means to live surrounded by nature, enjoy the bounty of its harvest at a plentiful table, and participate in the local events that animate Piemonte, the land of wine. Discover Langhe with www.unavisitatorino.eu, and book your private guided tour in Italian, English or French. The duration of the tour varies, depending upon your requirements. You can organize half-day or full day tours. A guided tour in Barolo to discover beautiful landscapes, ancient castles and the famous Barolo wine. The tour includes a guided tour of the wine museum in Barolo Castle, followed by a walk in the old town. The second stage is a visit to La Morra, where you can admire an incredible view of the surrounding countryside. A guided tour of Barolo and Barbaresco through their castles and ancient villages. The tour includes a visit to the Castle of Grinzane Cavour with its medieval structure, where Camillo Cavour – the first prime minister of Italy – lived for more than 10 years. The regional wine cellar is located in the castle; there, you can taste wines and other local products. The tour continues in the village of Barbaresco, located in the Langhe hills; famous for fine red wines with a bouquet of violets. In the village there is an ancient medieval tower that dominates the surrounding territory. A guided tour to discover Alba, the capital of the Langhe. It’s a charming old town with medieval arcades and ancient towers. A walk to enjoy the beauty of the city of truffles. A visit to Bra, one of the oldest towns of the Langhe. Located 15 km from Alba in the valley of the Tanaro river, Bra is famous for its wine and food. Its typical products include sausage and cheese. Nearby is Pollenzo, known in Roman times as Pollentia. In 402 A.D. the Battle of Pollenzo was fought between the Romans and the Visigoths. King Carlo Alberto promoted extensive modernization work in the village during the nineteenth century. The old medieval castle was enlarged, turning it into a country residence. Today, the complex is home to the University of Gastronomic Sciences. To truly know the Alta Langa, it is not enough to taste its food: you must live the experience. We welcome tourists and nature-lovers to the old farmhouse that we restored in Cerretto Langhe.